Goodbye Holidays . . . Hello New Year! The big winter holidays have now ended. All that is left are soon to be faded memories and maybe some handmade ornaments that you can save and add to your tree next year! This is my batch of ornaments that I am going to store for the following 11 months. They were a blast to make and really easy. Hopefully, some other people out there also made some handmade goodies that will be cherished year after year. Happy New Year. 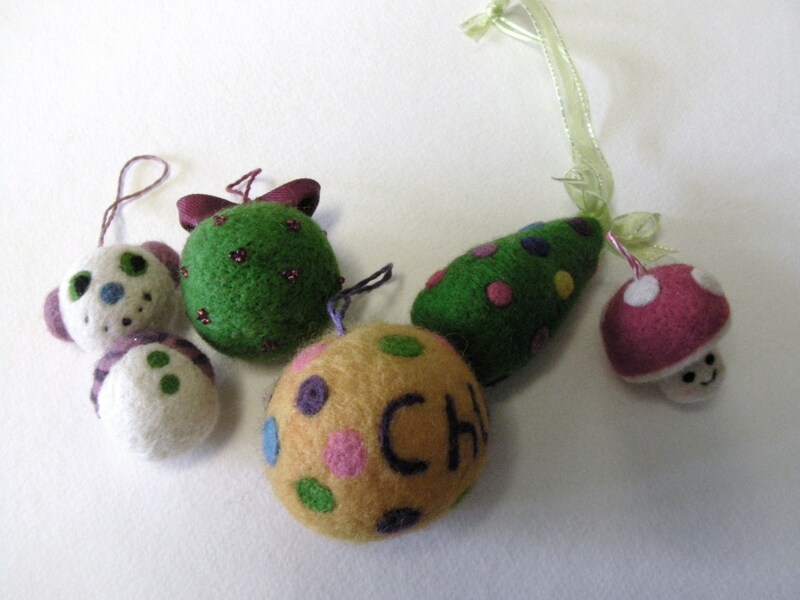 Each one of this felted ornaments were previously posted about with full vivid color. Feel free to check them out in their original form. 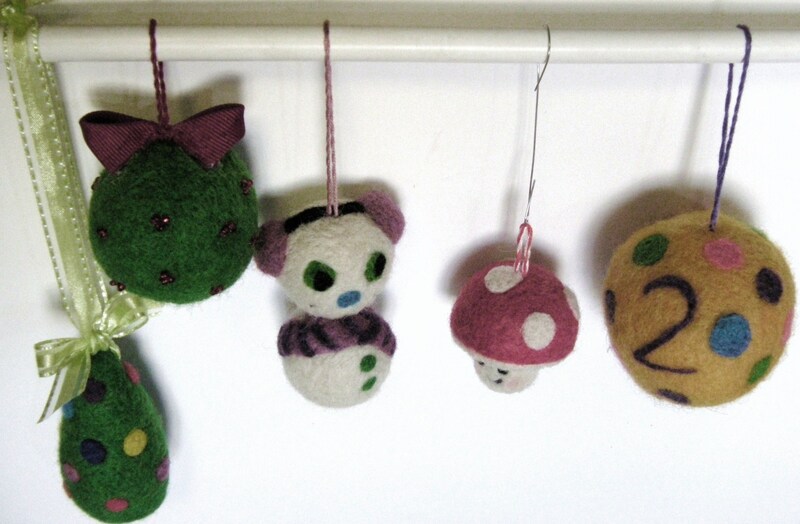 And don’t forget that just about any small cute felted toy can easily be transformed into an ornament with a string, some ribbon, yarn, or a metal hook. Once again, Happy New Year. I will be back shortly with a felted toy bird that is already in progress. Until next time . 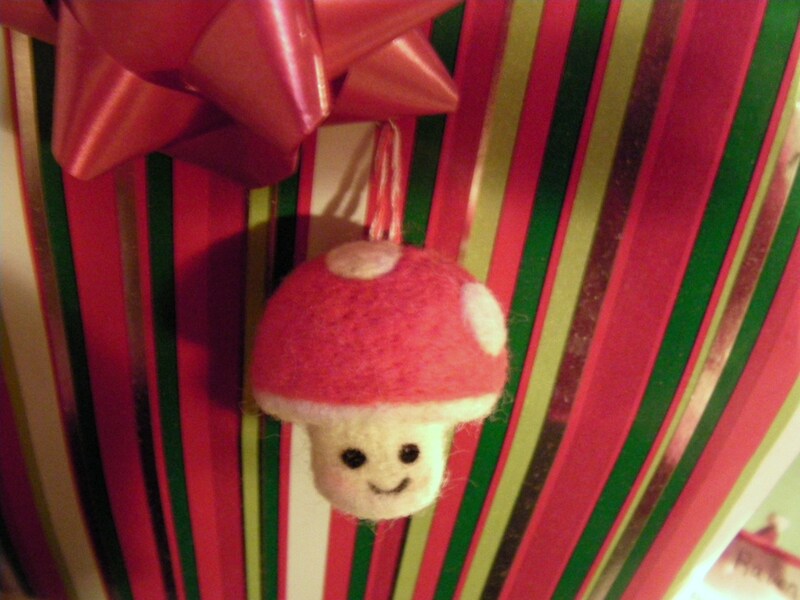 . .
My Tiny Felted Mushroom Ornament . . . Too Cute! The photos just cannot capture this cuties potential. 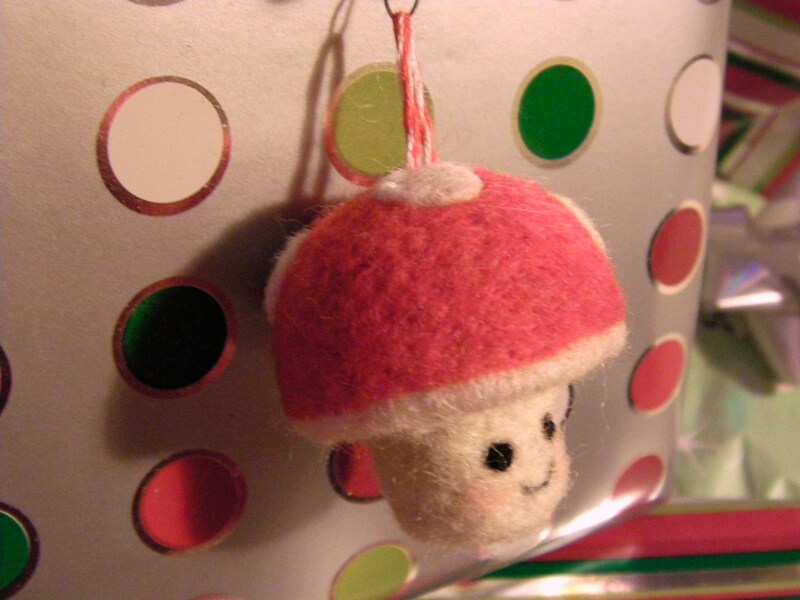 I’m in love with this tiny mushroom ornament/decoration. It is so adorable and itty bitty. I, as a mother of five, love adorable, itty bitty things! The red and white is perfect for this time of year; and our modern celebrations possibly are historically related to the amanita mushroom. 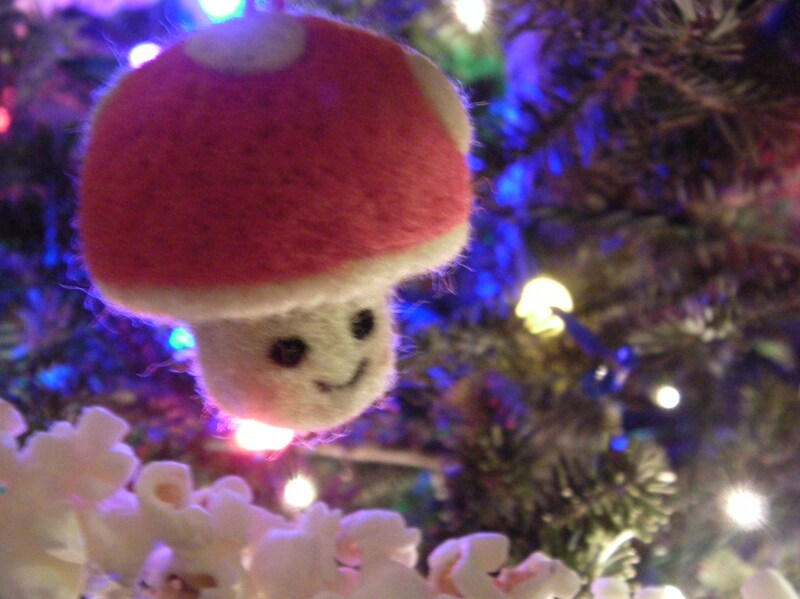 Whether our holiday roots lead us to a pine tree with mushroom underbrush or not, this guy is a perfect addition to my holiday decorations! Use it as a gift topper or as an ornament. I love the amigurumi style face on this guy, simple yet cute. I added some blush to his little cheeks; it’s amazing my blush color perfectly suits this little inanimate mushroom replica. 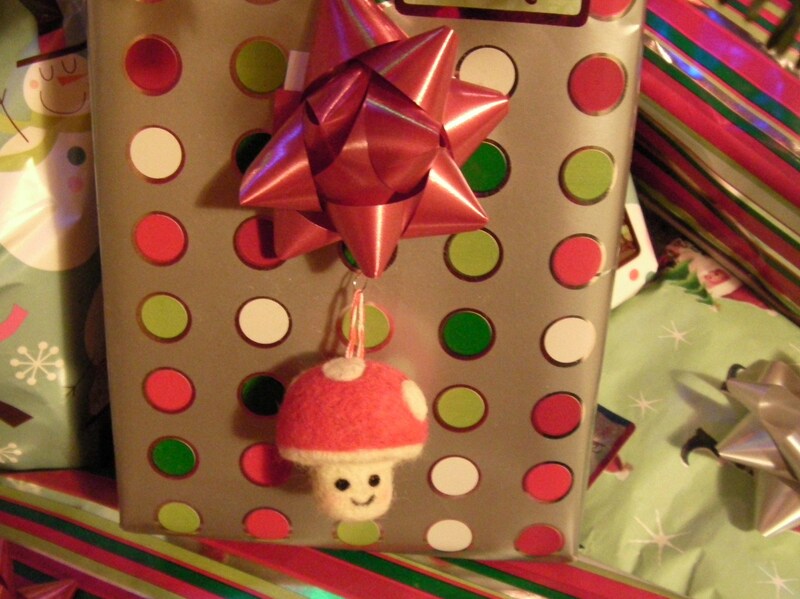 I used all my red wool up making this little ornament; so I’m going to have to dye my new wool stash and soon! HOW will I fit it into the busy holiday schedule??? Stay tuned and find out if I ever get to it! And does anyone know the correct camera settings for taking photos near a lit Christmas tree? It’s driving me crazy!